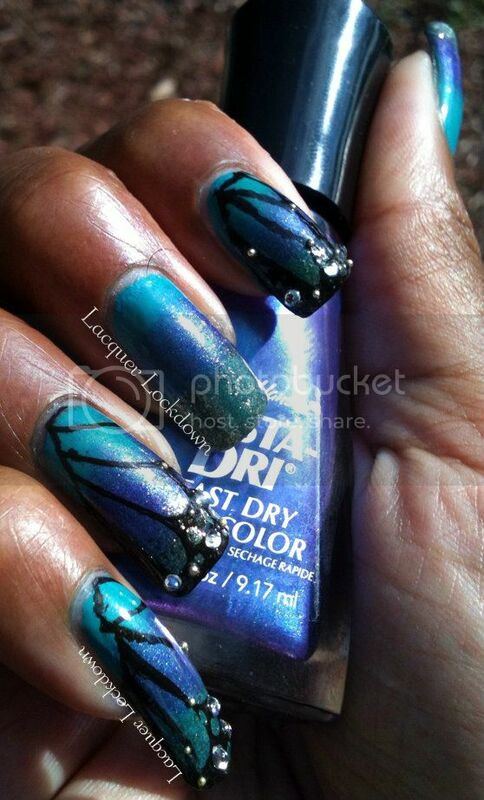 Lacquer Lockdown: Butterflies, Bling, & Duochromes Oh My! It's a jungle in here! Watch out for moving insect life! Also ignore the eyelash that somehow snuck it's way into so many of my pics - grrr! I used China Glaze Custom Kicks for the base. 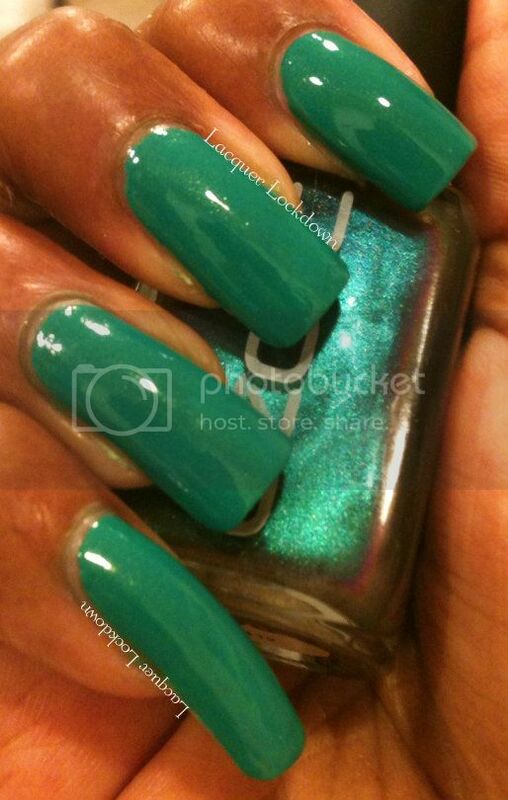 I love this color - turquoise with gold microshimmer and opaque in one coat. It's been a favorite of mine for years, but it does stain the hell of our your nails so a peroxide soak is necessary after use even with two layers of base coat. One careful coat pictured here. You can see the tiny particles of gold shimmer even with my indoors lighting. Don't ask me why I'm holding an Ozotic bottle I must have grabbed whatever snapping a quick pic. I used the "wet sponge" technique to create a gradient that is to all intents and purposes a non-rigid colorblock using Custom Kicks, Sally Hansen's Insta-Dri Grape Going, and OPI's Number One Nemesis. All this shimmer from those duochromes. I am so so impressed with OPI's Number One Nemesis in particular. 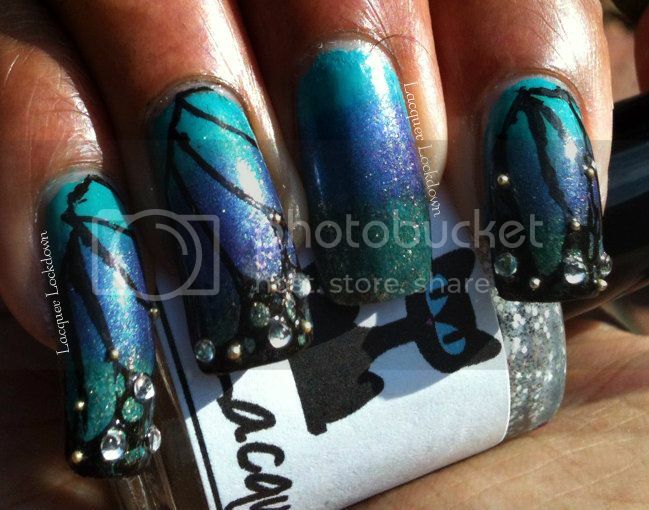 I had this but hadn't even used it yet until this manicure. 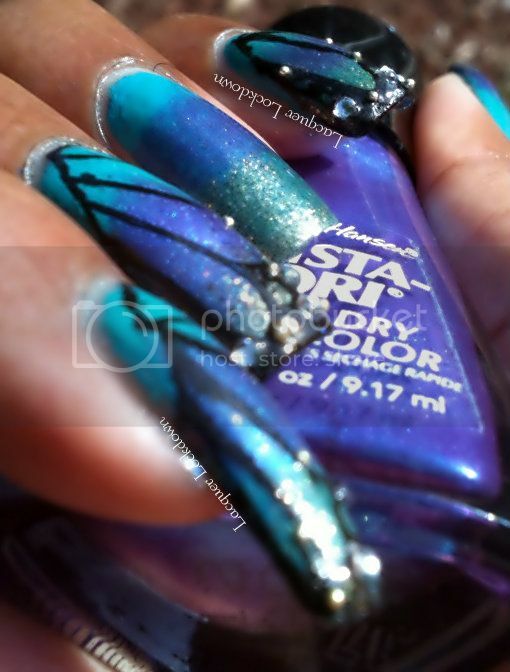 I love that the stamp allows for gaps to let the shimmer of the polishes underneath peak through. 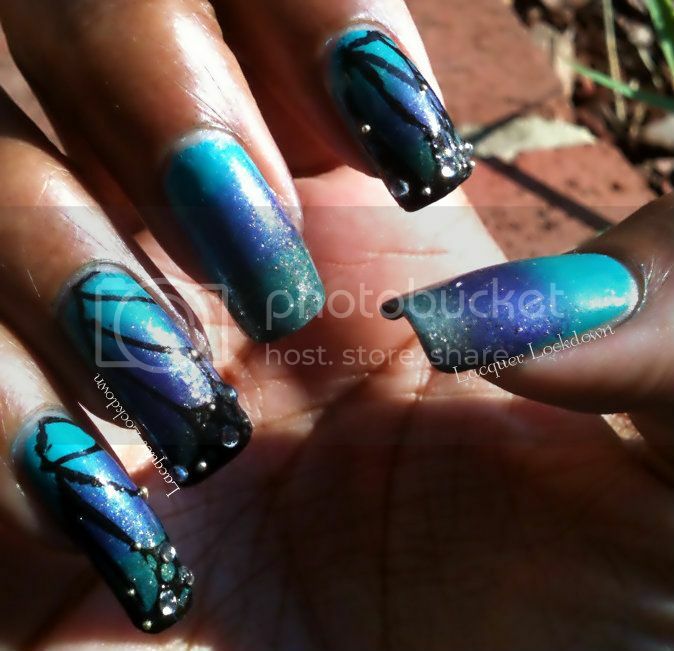 I stamped using my new Vivid Lacquer Plate #002's monarch pattern and Konad's Special Polish in Black Pearl. 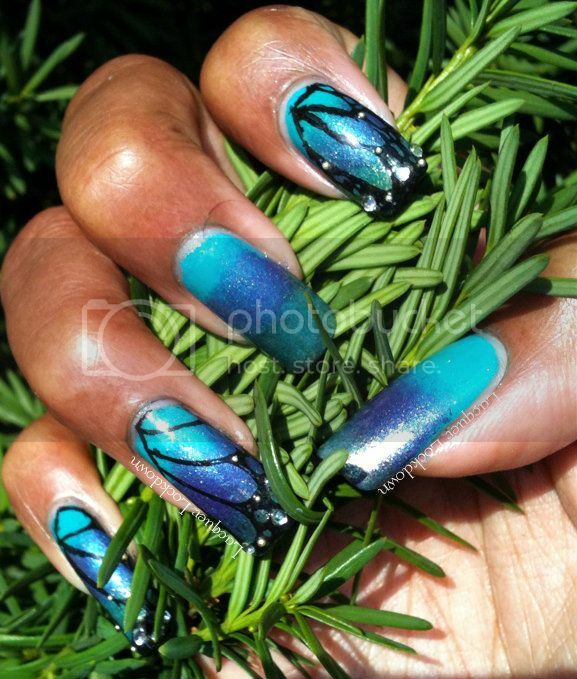 One thing I forgot to note about the VL plates is that the larger images such as the butterfly will not fit fully on the "traditional konad stamper" and you will need to use and XL stamper if you have longer nails. Not too much of an issue but worth noting since the XL stampers always require a bit more finessing to work with than the Konad ones. It would have been a lot to stamp every nail but then I am a big believer in non-symmetry in my nail art. I like seeing the "base" which is as pretty as the stamping as well. Finally, I added gold microbeads and 2mm clear rhinestones. Talk about instant pretty! This was one of those ideas where everything just came together perfectly. I want to be this happy every time I sit down to paint my nails though I know that's not gonna happen but for now I'll just sit back and enjoy. What do you ladies think? I put up a tutorial for this one too that you can check out below, but it's as straightforward as they come. Thanks for reading and toodles! 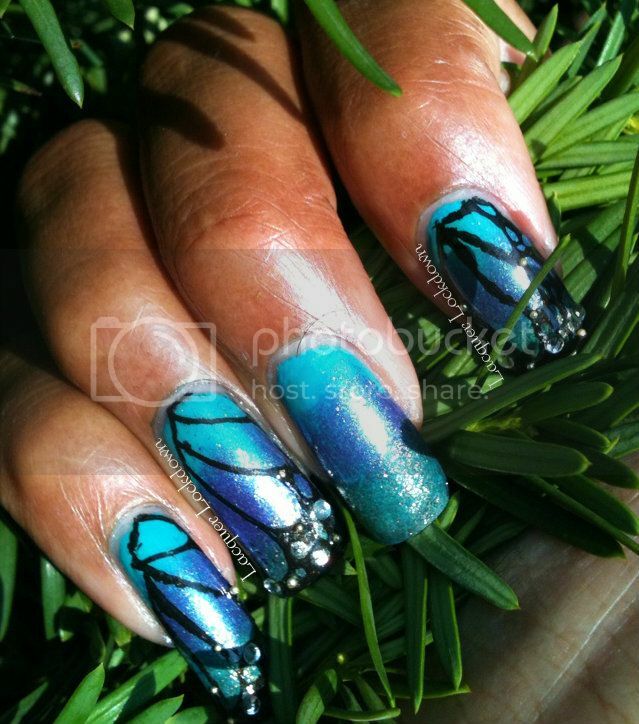 I LOVE your butterfly wings! They're gorgeous!! Thank you sweetness! I love them quite a bit as well too!